I found this web page http://www.healthguidance.org/entry/11397/1/Greek-Salad-Dressing-Recipe.html on Health Guidance website for Greek Salad Dressings. There are three choices, I ended up with my own version, you can use one of their Greek Salad Dressings or you can use mine, which follows. I suggest using a 12 oz (360 ml) Ball canning jar with plastic cover, as depicted in the above picture. Place dry ingredients in the jar. Using a glass cup measure, such as Pyrex with US Standard and Metric markings, squeeze the lemon juice into the measuring cup, add sufficient water to equal 1/4 cup (60 ml). Then, add olive oil up to the 1 cup (240 ml) level. Add the liquid to the dry ingredients in the canning jar, screw cover on tightly and shake to mix ingredients. Store in refrigerator. 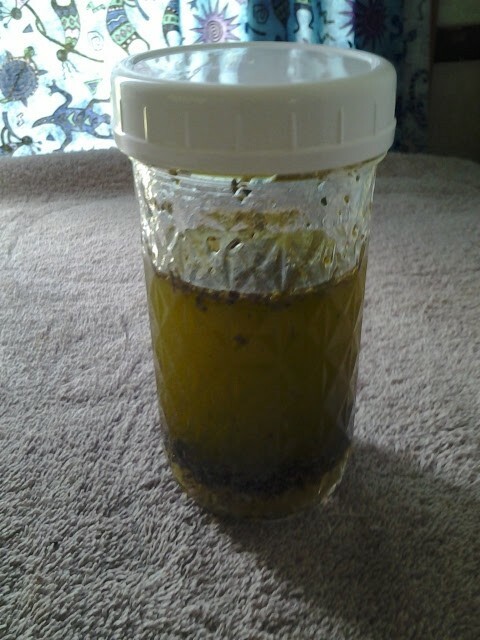 My refrigerator is set at 40° Fahrenheit (4° Centigrade) which makes the olive oil semi-solid, so I have to take the dressing out of the refrigerator 30 minutes before I am planning to use it, to allow the olive oil to return to it’s normal liquid state. This dressing looks great. Thanks for sharing the recipe!